We’ve all heard people sprout the phrase, “go on, you’re eating for two now” at barbecues, dinner parties and wherever food is being served, forcing pregnant women to decline offers of more and more food from well-meaning friends and family. While pregnant women don’t have to eat twice as much food, the growth and development of a baby certainly does rely heavily on its mother’s nutrient stores and intake during pregnancy. The Dutch Famine during World War II demonstrated that poorly nourished mothers were more likely to give birth to babies with restricted growth. Their children were also more susceptible to chronic diseases in adulthood. During pregnancy, a woman’s nutrient requirements increase by between 10% and 50%, depending on the specific nutrient. But her energy intake only needs to increase in the range of 15% to 25%. In Western societies, excess energy and body weight are more common than nutritional inadequacies. 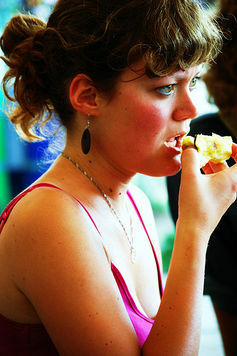 The amount of food a woman consumes during pregnancy shouldn’t increase substantially. Generally, it should only increase by the equivalent of two medium-sized pieces of fruit and half a glass of reduced-fat milk averaged over the pregnancy term. But everyone is different. If women do kick back and eat for two, they’re likely to gain too much weight, particularly if there’s not a substantial increase in physical activity. Recently, my colleagues and I found that one third of Australian women who were a healthy weight and just over half of women in the heavier-than-healthy category gained too much weight during their pregnancy. The complications arising from gaining too much weight during pregnancy include a greater risk of developing gestational diabetes, problems during labour for the mother and baby, weight retention after delivery for mothers and an increased likelihood that the child will become overweight later in life. Women who were a healthy weight before pregnancy should gain around 11.5 to 16kg. This is not to say weight gain should be restricted. Not gaining enough weight can have negative consequences for both mother and baby, so it’s important to achieve a healthy balance. women who are classified as obese (pre-pregnancy BMI above 30) should gain around five to nine kilograms. So how do women meet the extra nutrient needs without piling on the kilos? A pregnant body becomes more efficient at absorbing nutrients. A high-quality diet is still important but there is not as much room for those discretionary foods that have few nutrients but loads of energy. It’s important to eat four serves of fruit and five serves of vegetables every day. Lean meat, reduced-fat dairy products and wholegrain breads and cereal products will ensure women get plenty of nutrients without overdoing the kilojoules. There’s not much room for junk food during pregnancy. Physical activity is also important – maintaining an active lifestyle and getting 30 minutes of physical activity each day will help achieve a healthy weight. It’s difficult to meet folic acid and iodine requirements during pregnancy through a regular diet. So folic acid and iodine supplements are now routinely recommended for at least one month prior to pregnancy and for the first trimester. Ideally, the iodine supplementation should continue during pregnancy and breastfeeding. There is insufficient evidence to support taking other vitamins or a multivitamin unless low levels are diagnosed. While it might be nice to indulge during pregnancy, the “eating-for-two” myth should be discarded to give babies the best chance of optimal development and future health.